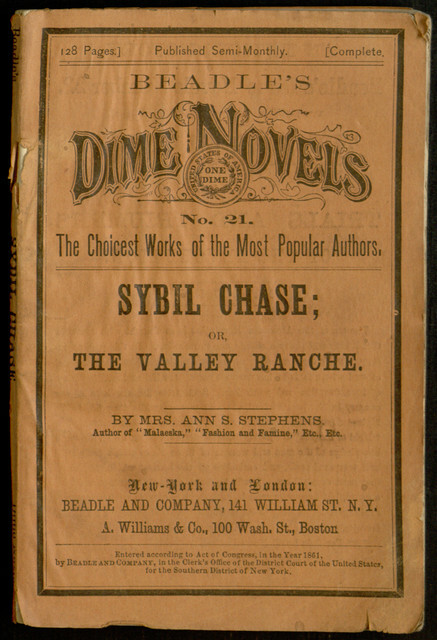 Our latest Distributed Proofreaders project is another early Beadle’s Dime Novel written by Mrs. Ann S. Stephens, who also happens to be the author of the very first book in the series, Malaeska, the Indian Wife of the White Hunter. 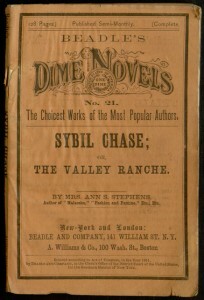 This title, Sybil Chase; or, The Valley Ranche, is a self-described “tale of California life,” first published in 1861. If you are interested in helping create a modern electronic edition of this vintage book, first read our earlier post about the proofreading system, then proceed to the project page.